Scentsy may be best known for their flameless fragrances. Their warming wax bars are sold in hundreds of scents. 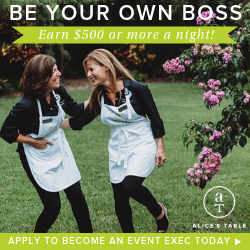 Earn a base commission of 20% plus bonuses as a Scentsy Consultant. Pink Zebra offers wickless scents in the form of “sprinkles.” Today, their product line has extended to include scented soaks and even jewelry. Business kits currently start at $99 and include a quick start program. Selling apparel may seem like an unusual home business, but this sector is actually on the rise. We have busy lives and this may mean the hours available for clothing shopping are limited. You can also take things a step further and become more of a personal shopper and stylists. KOKOON offers women’s apparel ranging from everyday casual to cocktail dresses to athletic wear. To give you an example of prices, most tops run in the $80 to $110 range. Stylists earn a base commission of 30%. Only a certain number of spots are open each season. LuLaRoe offers comfortable styles as primarily dresses, skirts and tops. Becoming a consultant isn’t cheap. But this company is on the rise in popularity. Ruby Ribbon focuses on essentials and shapewear. Over 90% of customers who purchase their signature Camis purchase again. 90%! New Stylists enjoy a 40% discount on samples. A Fast Start Program is available allowing new consultants the opportunity to earn unlimited free product credit. Several of the direct selling companies in the educational genre offer endless sales opportunities. Consultants may not only be able to sell to customers directly, they may also be able to partner with libraries, schools and more. Regardless of the company’s policies, these are definitely fun businesses. Usborne Books & More is a division of Educational Development Corporation and has been in business for over 20 years. They have been in the direct selling business since 1989. Almost 2,000 titles are currently available running the gamut from encyclopedias to activity books to fiction series. Get started for as little as $75. Simply Fun offers educational games and a base commission of 25%. Now we are talking consumable! You will find everything from jerky to chocolate available for selling from home. Many of these companies also offer auto ship programs that will allow you to earn a residual income as products are shipped to your customer’s door on a regular basis without the need for constant re-ordering. Tastefully Simple is a well-known and tasty name in the direct selling world. Re-orders are at the heart of this business and their customer rewards program encourages that. Get started as a consultant for a $39.95 enrollment fee plus your choice of join kit. Do You Bake? features easy food mixes with no additives, preservatives or fillers. In 2016, their product line included over 200 items. Join us an Ambassador with several starter kit options. We have a passion for purses right now, so it is only naturally that home business opps would be popping up in this niche as well. Thirty-One Gifts is a popular direct selling company offering personalized handbags, totes and organizational items. Earn 25% commission and get started for just $99. ClaudiaG offers a product line featuring leather handbags. Their pieces are on-trend and stylish. Most full-size purses are priced $99 to $199. With a 25% to 35% commission, this could be a very lucrative home business depending on the demographic of your customer base. These products fall more into the non-consumable goods arena, but that doesn’t mean you can’t get those repeat sales. Just like storefronts, home party companies usually introduce new items each season. Tupperware is known around the globe. There are currently 2.9 million Tupperware Brands Sales Force Members worldwide enjoying a flexible schedule and up to 35% commission on personal sales. If you want to sell jewelry from home you should be at no loss for options. New companies in this group are popping up on a regular basis. We also have some that have been with us for years. I Thought of You is a woman-owned business on a mission. Their product line features beautiful accessories created by hardworking people in developing countries. Through Fair Trade sourcing, I Thought of You is striving to provide a sustainable income to those who need it most. Curators can start their home businesses for as little as $99 and earn a commission of 25-50% on personal sales. This is a “zero-recruiting” business model allowing you to focus on what matters most – satisfying your customers. Stella & Dot has a product line that includes options for every style and budget. They have recently added even more accessories, handbags and totes to their collection as well. Chloe + Isabel is a unique direct selling company in that they only offer consultants to a select few in order to keep down saturation and keep company integrity high. Fill out the online application to be contacted with further details. Magnolia and Vine is a company offering customizable jewelry. Stylists can earn up to 40% commission and get started for as a little as $99. Skincare and cosmetics are likely the products to sell from home the majority of us are most familiar with. There are dozens upon dozens of direct sales companies in this industry available at any given time. There can also be a lot of turnover. Choose a company you love that has a great reputation. Arbonne offers luxury skincare items crafted from botanicals and scientifically tested. They strive to put out products that are pure, safe and beneficial. Arbonne offers a preferred customer program to encourage reordering. Get started for less than $100. Rodan + Fields products were developed with the help of two dermatologists – Dr. Rodan and Dr. Fields. They promise healthier, younger-looking skin. Enroll today for less than $50. Mary Kay has a lot more to offer than a pink Cadillac. Their cosmetics, skincare and personal care lines have been around for more than 50 years. Today, there are 3.5 million consultants located in 35 countries. Become a Mary Kay Consultant for just $100. This is a category that doesn’t get as much love as the rest, but there is certainly a want and need to preserve memories and traditions of the past. Heritage Makers is all about telling stories through photos. Turn your snapshots into storybooks, home décor, gifts and more. They have ideas available for both individuals and businesses. As a Distributor, you can not only sell Heritage Makers items but every line offered by parent company Youngevity. Paperly offers personalized stationery and gifts. Commissions start at 20% and go up to a generous 26% on personal sales with additional sales bonuses available. Paperly is still very much a ground floor opportunity. Get started for as little as $19. Are you passionate about pets? Don’t worry. There is a home business opportunity waiting for you, too. pawTree features products for cats and dogs. Their signature item is their pawBox which ships your pets’ favorite items to them on a regular basis. Commissions start at 10%. Kits are priced at low as $24.99. As you can see, the possibilities are endless when it comes to selling products from home. And with an established direct selling opportunity, you do not need to assume all of the risks that come with traditional business start-ups. Kaeser & Blair is a family-owned-and-operated promotional products company that has been in business since 1894. They are a leader in the promotional products industry helping entrepreneurs bring high-quality and affordable promotional products to local businesses. As a Kaeser & Blair business owner, you will be part of a company that has a spotless reputation with hundreds of vendors and business owners across the United States. K&B business owners offer services, products, and creative ideas to the businesses they choose to work with. With a low start-up cost and hours of online training materials, you have everything you need build your successful business. This industry can have a bad connotation attached, but it isn’t always necessary. While some opportunities in this category lean far more towards Multi-Level Marketing (MLM) than direct sales, there are some prominent and prevailing names in this sector. Watkins has been in business since 1868. Today, they have an expansive catalog that includes everything from health to home care to food. Their products are affordable and consumable. Get started for under $20. Norwex is on a mission to make sure every home is chemical-free. Their household cleaning products are extremely popular. The company currently offers an opportunity to earn your kit free. revital U offers products with a wide appeal. Their product line is coffee-based. Coffee is consumed by 80% of the population! From our sponsor, Erin Pyka: I am a busy mom of 2 girls, was a labor & delivery nurse, and a caregiver to my grandparents so I wasn't looking for anything to add to my already busy life. Once I found out that revital U is different and everything can be run by an app on my phone, I couldn't help but join — no parties, no going to the post office to mail out products, no inventory, and no required personal orders! The best news is that we don't sell, we simply give the gift of a sample! So for me, this was something I could incorporate into my already busy life very easily with my cell phone! Here's what you need to know; we offer 3 SMART products (coffee, cocoa, and capsules) all with the same active ingredients to help with mental clarity & focus, energy and weight-loss. Our products are affordable to the masses! And timing is everything - this is a ground floor opportunity! It's only $99 to start your own business today, and we offer a 30-day money back guarantee on our products AND the business. What do you have to lose? I'd love to send you a sample to try. Contact me on Facebook, via my website or by phone - 214-208-2317. I can't wait to hear from you! Have you heard of DoTerra? I keep seeing other bloggers promoting & I have a few samples I’ve grown to like. Seems fairly new, at least to me. I have! Essentials oils is definitely a more unique home business offering.